You can improve the performance of your Joomla site by turning on caching. When caching is turned on, Joomla creates a static file or “cache” of your website data on the disk. When the static file is found, the system retrieves the data from the disk rather than from the database. This improves performance because it saves system resources by not making redundant SQL calls to the database. To view our Joomla demo site with a custom template installed, please click on the thumbnail to the right. The site also includes other customizations made by our development team including Simple Image Gallery, which is a great way to show off images and create photo galleries withing page content. To turn on caching, login to the Administrator section of your Joomla site by pointing your browser to http://www.yourdomain.com/administrator (replace “yourdomain.com” with your domain name). Once you have logged into the administrator area, from the top menu select Site > Global Configuration. From here you can manage all the configuration settings for your Joomla powered site, including Cache, Statistics, SEO, Mail, Database, Metadata, Server settings etc. Go to the Cache tab, set “Caching” to “Yes” and set the Cache Time. Default is 900, If you don’t constantly update your contents, you might want to set it longer. We find that 3600 seconds is suitable. The Cache Folder is set automatically, if you want to use a different folder enter it’s path here. If you use a different folder make sure it has the correct permissions and is writeable. Click “Save” and caching is now enabled. You can further improve the performance by caching modules whose content does not change constantly. In this example we enable caching for the main menu module. You can repeat the process for other modules you wish to cache. Note: not all modules have the Cache functionality. 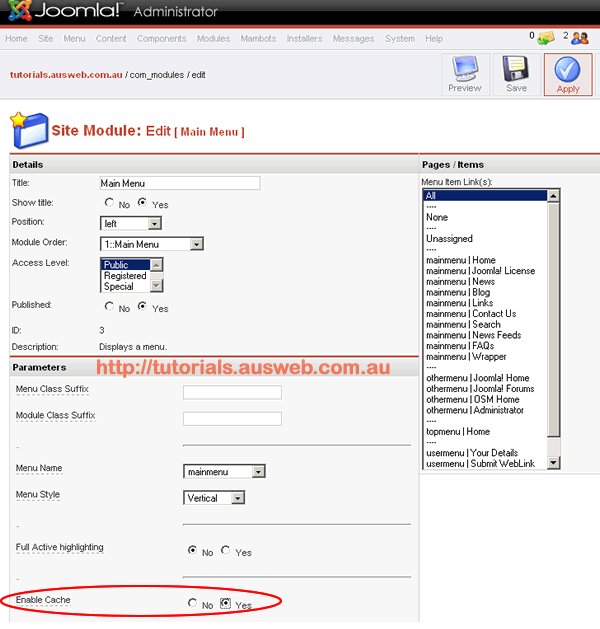 Go to Modules > Site Modules, select the Main Menu module and click edit. Set “Enable Cache” to Yes and click Apply or Save. The Main Menu module will now be cached. Repeat this procedure for any other modules you want to cache.